The first time we took our new yacht out, we just motored around Pittwater, huge grins splitting our faces from ear to ear. We own a yacht! We own a yacht! After a while, once we’d done a few doughnuts and got the feel of her, we unfurled the foresail and pottered along with the motor off. We’re sailing! We’re sailing! It was exhilarating, wonderful, a dream come true. And, it must be said, somewhat scary; not the act of sailing particularly, but the fact that we were floating around on our life savings. Then, rounding a headland into the jaws of the open sea, we crossed into several metres of swell and everything suddenly went topsy turvy We were only pottering along under the headsail and didn’t have the headway to handle the gusty conditions. We concentrated very, very hard to beat our way back around the headland, and came through unscathed, only a little shaken, and if truth be told, very pleased with ourselves. So… we bought a second-hand Zodiac inflatable tender from eBay; unbreakable crockery, cutlery, cookware, breakable glasses (never drink wine from plastic!) and bedding from the local shops. We bought a fire-blanket, a man-overboard ring, a floating Dolphin torch. We bought buckets and brushes and polyrope and string, batteries and tools. We bought life-jackets, cleaning equipment, boat-soap, a chart. 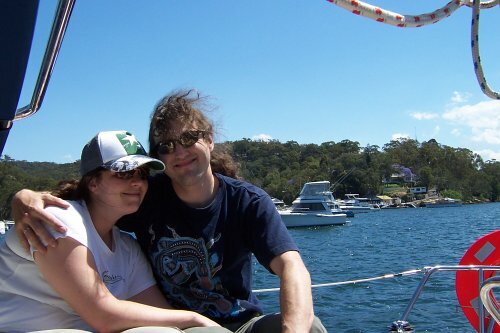 We were living in Canberra at the time, a landlocked city in a landlocked state, and since we found it quite inconvenient to have the boat moored some four and a half hours away, we moved to Sydney. We were starting new jobs and were still househunting, so the obvious thing to do was to live aboard. This we did for quite some time, and thoroughly enjoyed it, although it did become clear after a while that the yachty lifestyle and the office lifestyle don’t really coincide. Each morning we got up, climbed into the tender, and rowed ashore with all our office and motorcycle gear in waterproof bags. Then we showered and changed at the marina and rode to work; reverse in the evening. This was all fine and lovely on a peaceful warm day (although rowing home on a sultry evening wearing motorcycle armour over business attire is a sweaty exercise), but got to be tricky when there was a storm blowing. On one occasion, a hailstorm hit half way out, and we had to take shelter on the closest moored yacht as chunks the size of golf balls rained on our heads and metre-high waves filled the Zodiac. One of the lessons that we had absorbed from extensive reading was that when accidents happen to yachts, it is almost always because they have a personal reason to be at point A when the environmental conditions require that they remain at point B. Examples we had heard of included trying to get to a particular country to meet relatives at an airport, and, of course, racing. Getting to work in the morning, and getting back to the boat for dinner, seemed to us to fall very much into this category, and applied just as much to our little Zodiac as to Pindimara herself, who was of course perfectly safe on her mooring in all weathers. One final problem was the wear and tear. Full-time liveaboard inevitably results in some knocks and dents to the interior woodwork, and messy accidents do happen in any home. We were trying to keep the cabins as pristine as possible with an eye on future resale value, and we soon noticed that the interior was looking a bit shabby and we had no time or opportunity to do anything about it. We also started to notice problems with damp from condensation, and salt in all the fabrics. Somewhat regretfully, we rented a flat nearby. This did not, of course, mean that we stopped sleeping over on board, and it certainly did not stop Bronwyn from creating ever more sumptious and creative banquets in the galley. The wine cellar aboard began to rival, and then to exceed, the one that we kept at home. One evening, we were sitting in the main cabin, variously reading cook books and sewing new sail ties (an early lesson learned: on a yacht, you can always find some little task to fill any spare time, if you are so inclined) when something moved on the floor. Always alert to any changes in the boat, I had a look, and found a large cockroach. Not thinking too much of it (all the ports were open, and it was a warm summers day), I lobbed it into the sea. A few days later, we saw another one. Then another. A little investigation in back corners revealed little piles of droppings, so we cleaned them up and sprayed Morteine around the place. However, it soon became clear that we had a bit of a problem. It all came to a head one night when I was woken by a two-inch roach running along my arm and across my hand. I overarmed it out of the hatch, and later that day we rowed our budgie ashore (it was living in a cage on deck) and set off three roach bombs, enough to clear a small house. For weeks after, dead and dying insects appeared all over the boat, but we didn’t see any more fast-moving ones. Of course, we had been reading up on the issue, and it seemed that we had only ourselves to blame. Our lockers are spacious, and things tend to move about in them, so we had compartmentalised them with cardboard boxes from the supermarket. Apparently, roaches love to lay their eggs on the cardboard that they find in warehouses, where they remain until they find themselves in a warm, damp environment into which they can hatch. The common answer is to ban all cardboard from the boat. This made a mess of our packing arrangements, and we did the best we could with fabric and bubble-wrap. Some cruisers go further, and ban all paper products, including the labels on tin cans, but that seemed somewhat excessive, and in any case, who could live without books? We sterilised all our remaining paper on deck in the burning summer sun. As weekends of sailing went by, we started to think about maintenance. We bought deck oil and gelcoat restorer, metal polish, a small passive dehumidifier. There seemed to be no end to the things that we needed to, or could, or felt like buying. A trip to the local chandlery to buy a split-pin would likely as not result in a triumphant exit with armfuls of shiny new equipment. We had been told to expect to spend 10% of the purchase price per year on maintenance and upkeep; surely this could not be true? We started to keep records. Although we had promised ourselves that we would go sailing at least once a fortnight (or demand a damn good reason why not), there was a period of some six weeks through the hottest part of the Australian summer when we were on holiday in other parts of the country. During this time, Pindimara just sat and bobbed in the warm sea. On our return, we dropped the mooring and motored off, happy to be afloat again, but as soon as we cleared the marina, we knew that something was very wrong. The motor felt very strange, and even on full bore we weren’t getting anywhere near the rpm that we should have, and were making barely a knot through the water. We returned to the mooring. I cleaned all the engine filters and checked the oil. We ran the engine in neutral, and it seemed just fine, so it was on with the mask and snorkel and over the side to have a look at the propeller. The problem was easy to see. While we’d been away, an entire coral reef seemed to have grown on the hull, complete with large fish peering disdainfully at me through the fronds. In fact, there was so much growth over the sail drive unit that I couldn’t see the propeller at all. We leave her alone for a moment, and all these characters move in. It was, quite clearly, time for our first antifouling treatment. This entry was posted in Australia, Oceania, Travel, Voyage of Pindimara and tagged Sail on 2006/09/30 by Reinhard.